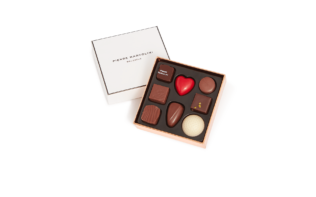 Victoria Beckham has partnered with world renowned chocolatier Pierre Marcolini to design a limited-edition box of 16 chocolate hearts to celebrate the milestone 10th anniversary of her iconic fashion house. Meeting in Paris a city close to both of their hearts, the pair masterminded a chocolate box special enough to mark the occasion. 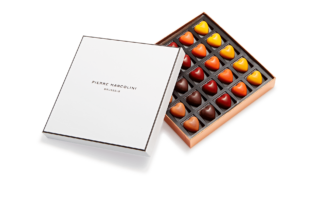 The extraordinary know-how and contemporary approach of Pierre to create the best chocolates in the world, aligned with Victoria’s forward thinking vision, made this the perfect collaboration. 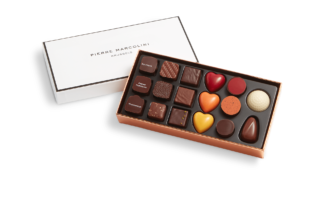 Scouring the globe for the finest cocoa beans and ingredients is Pierre’s passion in life. Just like Victoria, Pierre’s adventurous nature leads him to put a contemporary twist on an enduring classic using rare and exotic ingredients. 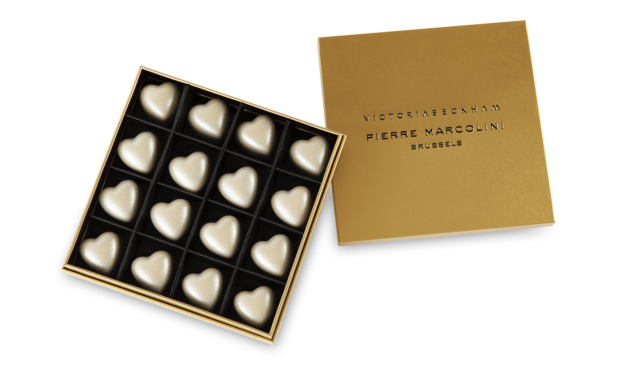 Victoria’s chocolate hearts are no exception with distinctive flavours including. Sugar, hazelnuts, cocoa butter, cream milk powder, feuilllentine (contains: gluten, wheat, barley, soy, milk, lactose), cocoa beans, lactose, soy lecithin without GMO, glucose, food colouring agent E171, natural vanilla, salt.